The trial of a Philadelphia abortion doctor accused of killing one woman and seven babies has entered its second month. 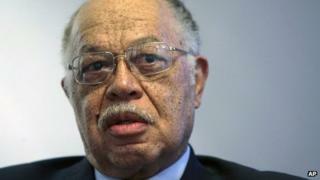 Former employees have testified that Kermit Gosnell, 72, ran a dirty, outdated abortion clinic with unqualified staff. Prosecutors contend he made millions, relying on untrained, low-paid staff. Defence lawyers argue that no babies were born alive and that the woman died of unforeseen complications. Dr Gosnell faces the death penalty if convicted. The trial has so far involved four weeks of presentation of evidence by the prosecution. It is unclear if Dr Gosnell will testify when the defence begins presenting their case. His lawyer, Jack McMahon, has attempted to discredit prosecution witnesses. The FBI originally raided the clinic in February 2010 to investigate Dr Gosnell's high-volume distribution of painkillers, allegedly to addicts and drug dealers. Among the witnesses called during the prosecution's case were eight former employees who have pleaded guilty, some to third-degree murder. They have testified to performing ultrasound scans, giving intravenous drugs and helping with abortions, even though they lacked medical training or certification. Unlicensed doctor Stephen Massof testified that Dr Gosnell taught him to cut the necks of the foetuses after they were aborted to ensure they died. Another former employee, Ashley Baldwin, said she had begun assisting with abortions, including administering drugs shortly after she started working there, aged 15, through a training programme. She saw aborted foetuses move after the procedure on at least two occasions, only to have Dr Gosnell explain the movements as an involuntary response. In one case, Ms Baldwin said, "the chest was moving". Abortions in Pennsylvania are illegal if not performed by a licensed doctor and if done past the 24th week of pregnancy if the mother's life is not in danger. According to a grand jury report, records of the length of the pregnancies at the time of the abortion were allegedly fudged by non-medical staff using ultrasounds. Other records were lost entirely. During the raid, officials also found foetal remains frozen or refrigerated, including severed feet employees testified were to be used to determine paternity. The grand jury report has also cast blame on Pennsylvania's regulatory agencies, arguing that they did nothing to respond to a series of complaints and site violations against Dr Gosnell as well as after the death by overdose of Karnamaya Mongar, a refugee from Nepal. Dr Gosnell's co-defendant Eileen O'Neill is charged with charging doctor's fees and participating in a corrupt organisation. She had lost her medical licence and was trying to regain it while working at the clinic. Ms Baldwin's mother, Tina Baldwin, had begun working at the clinic's front desk earlier and was also given the responsibly of administering drugs. She testified that Ms O'Neill treated mostly older patients suffering from high blood pressure or diabetes and kept her office neat, in contrast with the rest of the clinic. Dr Gosnell, who is black, steered wealthy or white patients to her office, Tina Baldwin testified. He also met such patients and administered their medications himself, she said. "Nine out of 10 times, if the patient was white... he didn't want me to [give the drugs], because he wanted to meet with them himself,'' she said. He told his staff, "that's the way it is", Tina Baldwin said. Defence lawyers have also argued that Dr Gosnell should not be held accountable for Mrs Mongar's death in 2009, saying there were unforeseen complications. In opening statements, Jack McMahon, for the defence, said the doctor was not a criminal, even if he didn't run the "Mayo Clinic" - a highly regarded medical practice based in Minnesota. Prosecutors say Dr Gosnell profited greatly from employing low-paid, unlicensed staff, while performing as many as 1,000 abortions a year, charging from several hundred dollars for an early abortion to several thousand for a three-day long, late-term procedure. Officials said they found about $250,000 (£263,000) in cash at his home in a poor area of Philadelphia after the 2010 raid of his clinic. The trial is expected to continue for at least another month.